You can now have a guaranteed view of the highly anticipated New Year’s ball drop spectacle. This easy-to-follow video teaches you how to recreate the splendor of watching the ball drop right on your nails. Get ready to paint a truly magical scene. Line up your nail tools, and have a bottle of bubbly on chill to reward yourself after completing your work of art. You should also prepare yourself for revolving compliments because no one will be able to stop themselves from gazing at your nails all night long. 2. Apply the gel base coat on top. 3. 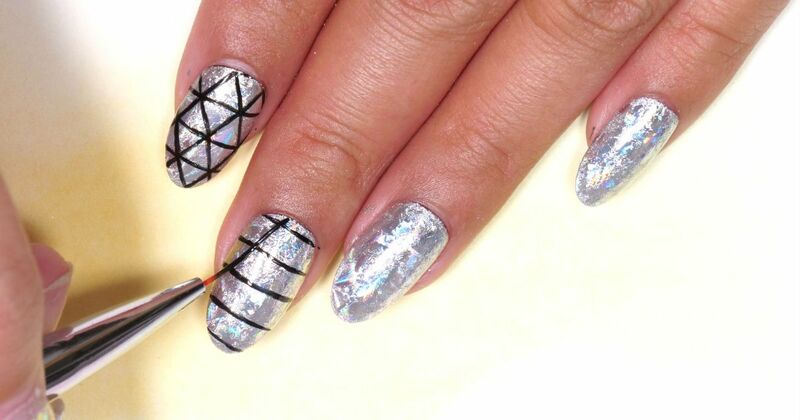 Dab the silver metallic foil on the surface of each nail. 4. Coat your nails with an additional layer of the gel base coat. 5. Use the black gel polish and striping brush to outline slanted lines on each nail. 6. Draw more slanted lines going in the opposite direction until you begin to see diamond shapes. 7. Perfect the ball drop design by tracing horizontal lines in the center of the diamond shapes. With so many nail design options, it's difficult to pick just one. Read here to discover 7 new nail designs for autumn. In the world of mythical creatures, unicorns reign supreme. Add a little whimsy to your week by painting a pastel unicorn accent nail. Choose your favorite gold polish, add the golden bling and you have a stylish and modern decoration at your fingertips. This is not a difficult design to master -- and you’ll love the results! The beautiful braid will make your hair look thicker and the elegant crossovers make this style a great option for dressier affairs. One thing is for sure, it won't leave anybody indifferent. Achieve sleek, shiny hair without sacrificing its health with these amazing straightening tips. It's much simpler than you think to create the illusion that your eyes are larger than they actually are.